In a nutshell: I’m fairly certain Jerry Spinelli is a hypnotist. Or a magician. One or the other or both. After reading his latest novel, Hokey Pokey, I felt like I was drugged and had to slowly fade out of the book’s spell, a dream of a world unlike anything I’ve ever read. Hokey Pokey is a childhood fantasy-like world, a wild west showdown of a place where kids reign, similar to the time of cowboys but with bikes and trikes as their trusty steeds. Almost the entire story takes place during the course of one day when main character Jack wakes to find his bike, his pride and joy, gone. “The girl” has taken it and left him in his bike-less shame. Jack and his Amigos, Dusty and LaJo, set off to retrieve it. But something else is different about Jack, and his friend LaJo is the first to see it. The tattoo on his belly, the one all kids of Hokey Pokey have as a right of passage, is fading. And fast. Like the story of The Kid, a mythological story all kids of Hokey Pokey know too well, Jack is destined to go away. As the reader follows Jack and his cronies throughout the day, the story seesaws, teetering between childhood and what possibly lies beyond Hokey Pokey. An unknown, mysterious place that is unclear to all in the land. For the first five or six chapters I had absolutely no idea what was going on. Then like a camera lens to its focal point, Hokey Pokey slowly came into focus: the neighborhood, the playground politics, the friendships, and the rivalries. An element from the story that I enjoyed, and left me reminiscing about my own childhood, was that every day was in the present day. As a kid, there wasn’t much thought of tomorrow unless it was Christmas Eve. As an adult, life if full of tomorrows. The days are fleeting, but I remember a time when a hour seemed like a year and tomorrow was an eternity away. I miss that. I miss the time, or rather the timelessness, of childhood. Hokey Pokey captures this perfectly. Something I remember Jerry Spinelli saying during the ALA Midwinter Newbery Panel Event in Seattle a month ago was that, and forgive my paraphrasing from memory, He doesn’t write for kids. He doesn’t write for adults. He doesn’t write with any age in mind. He just writes and it just so happens that his books are published for children. I was reminded of that a lot while reading Hokey Pokey, because it truly is ageless. It is a story that will resonate with any person that has gone through the growing pains from childhood to adolescence. That said, I have read this book as an adult and I am very interested to see how kids take it in. 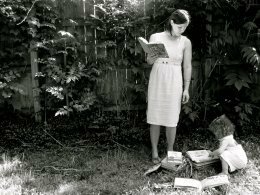 But in my reading experience it was like reading a dream, or even a faint memory. Part of me feels that I still haven’t fully digested this book, and that I need sit on it more and perhaps reread it. Maybe Mr. Spinelli isn’t a magician or a hypnotist, but is simply a fine writer. And at one point, like the rest of us, he was also a kid. To be able to conjure a childhood atmosphere, one that is all too familiar to everyone, is an extraordinary feat. You have to read it to believe it. Sheer magic. Extras: Map of Hokey Pokey. And yes it will make absolutely no sense to you until you read the book, but I thought I’d share it as a device of intrigue. 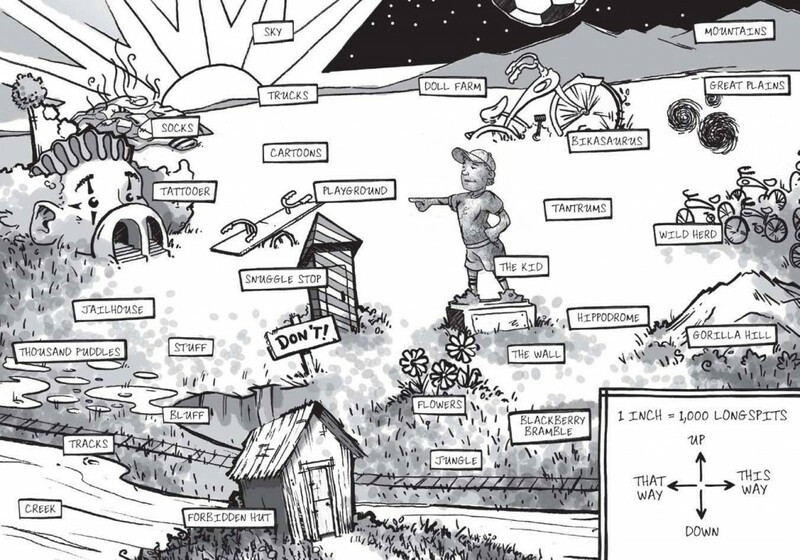 Map image source via NPR’s interview with Jerry Spinelli in “Kids Rule in the Land of Hokey Pokey”. More information regarding Jerry Spinelli and his books can be found on his website. His bio made me tear up. I’m a huge cry baby about all things “love” and he has a clear love for his family, his wife, and his work. Source of book reviewed: From the wonderful people over at Random House Children’s Books. 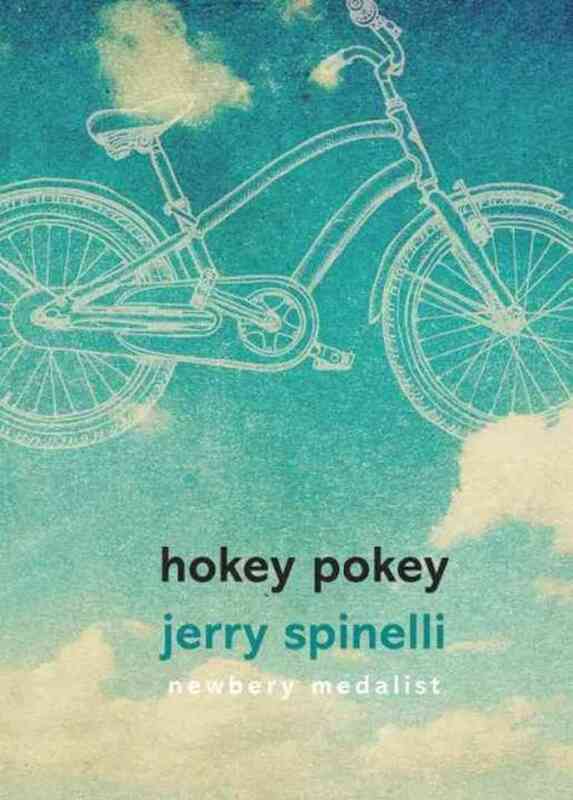 I was thinking just the other day, I have never read any Jerry Spinelli. I read the backs of his books many times when I was at my old bookstore job, but I never actually sat down with one of his books for the long haul. I think that will have to change soon. This one sounds amazing. Danzel– I would love your perspective if you do end up reading Hokey Pokey. I feel we have very similar reading tastes and would enjoy hearing what you thought. Keep me posted! I think this will end up being the most divisive book of 2013 once award talk starts again. People seeming to be loving it or hating it. I have to say I’m in the latter camp. It didn’t work for me on any level. Brandy– I completely agree with you regarding the love it/hate it banter when award talk starts back up. When a book is extreme in it’s approach, the response is usually extreme. I always enjoy hearing both sides of a reader’s reaction. Thank you for yours. Putting it on our list!